So by now my latin dress is looking like a dress. Yay! But definitely far from finished. The fringing has been completed. 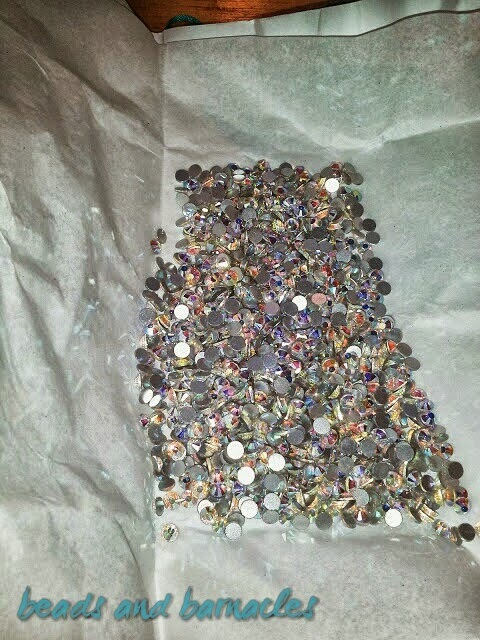 But now for the fiddly and time consuming part… Stoning! Most ballroom and latin dresses are pretty heavily embellished to make them sparkly and to stand out on the dance floor. My dress will be no exception. I wanted to use stones that correspond to the colour of each layer of fringe (jade, light purple, dark purple). But matching stone colours is not exactly the easiest thing in the world. So I spent a long time looking at all different colours and makes to try and get good value but good looking stones. 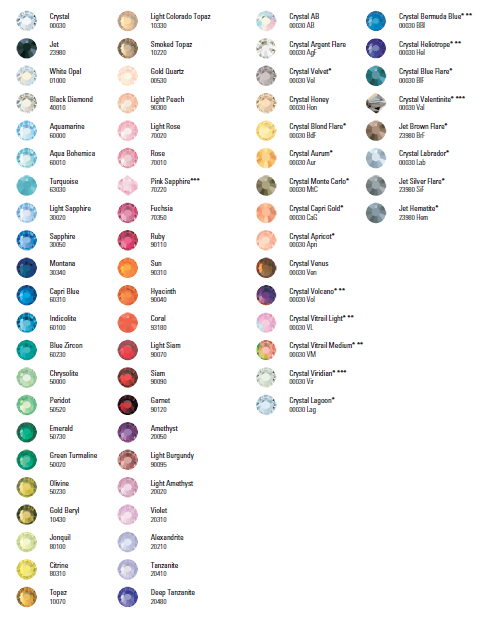 Here you can see the range of colours, and this is just from one supplier! Generally Swarovski are the best quality stones, although there is a large potential for people trying to sell you fakes as they are the most expensive. The second best is (I think) Preciosa although there are a number of other ranges which are also good quality. But it does depend on how much you want to spend, because you can get some quite cheap rhinestones which may be acrylic or resin, but they do have less sparkle than the glass cut ones. But it’s all a balancing act between cost and appearance. 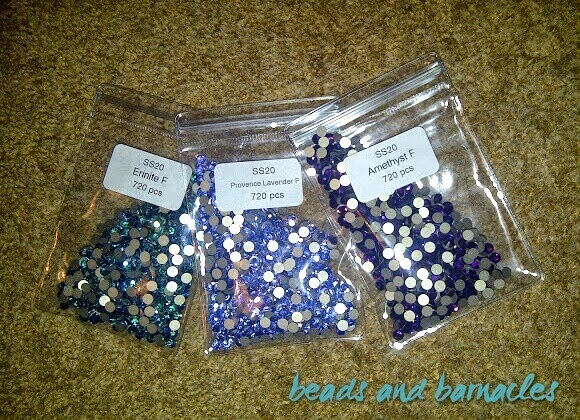 Eventually I settled on some Swarovski stones in three colours: Erinite, Provence Lavender and Amythest. Here you can see them looking very nice and shiny! Although the erinite is not an exact match for the jade fringe it is quite close and the other colours were not available in the size I wanted. 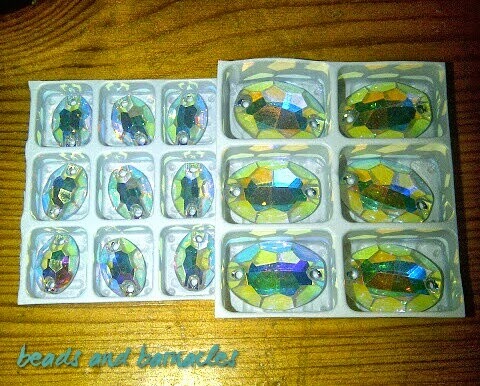 To balance out the colours I also wanted some plain crystal rhinestones, although I went for crystal AB (aurorae borealis) as it has more of a sparkle, and finally I also decided to get some larger Preciosa sew on stones in 2 sizes to attach on the top section to make a pattern around. Along each layer of fringe I will stone a line of the corresponding colour of rhinestone. On the top section (left side – smaller) I will sew a number of the small sew on stones, and in between the stones I will alternate between all 4 of the rhinestones. The edge of the fabric will be stoned with the crystal AB stones. The top section (right side – larger) will have larger sew on stones with some smaller sew on stones between them, and then the gaps will be filled with the 4 colours of stones, again it will be edges in the crystal AB stones. This will continue along the unfringed fabric, round to the back of the dress. Glueing the stones to the fabric can be quite difficult, although I evolved a technique using a set of tweezers to pick up the rhinestone, I would dab the glue onto the fabric where I wanted the stone to go and then after placing the stone on the fabric I used a blunt pencil to hold the stone in place for a number of seconds. My next blog post will say some more things about attaching the stones and have lots of pictures of it progressing!